Besides his obvious contributions to rock and roll music, Eddie Van Halen has inspired the creation of guitars that have made exciting and important contributions to the guitar market for decades. From his earliest homemade guitar, which he nicknamed Frankenstein, to instruments manufactured by Kramer, Ernie Ball, Peavey, Steinberg, Charvel, and Fender, the guitars Eddie has played have continually evolved along with his music and have become an inseparable part of some of the most memorable songs in rock and roll history. Eddie coined the phrase "The Brown Sound" to describe his distinctive tone, and no matter which incarnation of guitar he has played throughout the years, his sound has always been unmistakable. 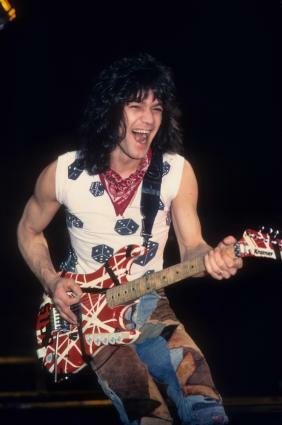 Early models of EVH guitars date all the way back to the 1970s, when Eddie Van Halen put together his first custom instrument. Though these older models can be difficult to find in the used guitar marketplace, their legends will live on. The Frankenstein, assembled by Eddie in his garage, is the guitar that started it all. Legend has it that Eddie started taking apart an old Stratocaster guitar, intending to route out the single coil bridge pickup slot and install a humbucker pickup in its place. He screwed the new pickup directly to the wood, creating a more solid tone with less sustain. He wired everything to the single volume knob, then bolted on an old Charvel guitar neck and performed an improvisational finish job with electrical tape and a can of spray paint. Part inspiration and part accident, the Frankenstein guitar reflects all that is endearing about Van Halen's music. Eddie Van Halen began playing a Steinberger GL 2T guitar both on stage and in the studio in the 1980s, when Sammy Hagar joined the band. The custom painted guitar hearkened back to Eddie's red, white, and black Frankenstein guitar. The most notable feature of Steinberger guitars is the fact that they are headless, and this design allows a guitarist to transpose the entire guitar into a different key with the flip of a switch. The song Summer Nights on the 1986 album 5150 is played on the Steinberger GL 2T, and if fans listen very closely, they can hear Eddie transpose his guitar down a full step after the intro. Produced from 1990 to 1995, the Ernie Ball EVH, also known as the Music Man EVH, was a departure for Eddie Van Halen in many ways. First of all, the guitar was the first of Eddie's that did not have striped graphics. The finish of the EVH was a lovely natural wood flame, and it featured two pickups instead of one. The Ernie Ball EVH reflected the evolution of Eddie's songwriting and his desire to continue to expand the sonic potential of his playing. Guitarists who are interested in picking up one of these vintage guitars can check eBay, where they occasionally pop up. Following Eddie's departure from Ernie Ball Guitars, he formed a partnership with Peavey Electronics to create his next guitar, the Peavey Wolfgang. Named after Eddie's son, the new guitar had a body that bore a strong resemblance to the Ernie Ball EVH guitar, except the Wolfgang had an arched top. These beautiful guitars were produced in a variety of finishes from 1995 to 2004 and are still highly sought after today. Guitarists who want to buy a Peavey Wolfgang will need to scour online auction sites and second-hand retailers to score one. 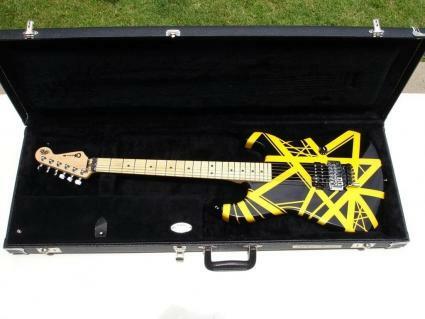 In 1984, Kramer guitars manufactured an exact replica of Eddie's Frankenstein guitar for Eddie so he could retire his original guitar. They never offered this guitar to the public, but in 2003, Kramer, which is now owned by Gibson guitars, began producing an affordable version of the 1984 Reissue guitar for the marketplace. It has since ceased production. These 1984 Reissues can sometimes be found on eBay or on Amazon. The EVH guitar phenomenon continues unabated into the present day, with high-quality guitars that carry forward the legacy of one of rock's greatest guitarists. The Charvel EVH Art Series guitar was launched in 2004 as a high-end collector's guitar that hearkens back to the guitars Eddie played in the earliest days of his band. The most compelling feature of these guitars is that they are all hand painted by Eddie himself. Included is a certificate of authenticity and a photo of Eddie playing the guitar. These simple, high quality guitars are available in either white and black, yellow and black, or red, white and black striped finishes. These guitars are only made available when Eddie has the time to create them. The Wolfgang Striped Series carries forward the tradition of bold striped designs on Eddie Van Halen guitars. Guitarists can choose from black stripes on a red body, yellow stripes on a black body, or black stripes on a white body. These instruments feature time-honored EVH guitar specs such as the direct-mounted humbucking pickup, single volume control knob, basswood body, and Floyd Rose tremolo system. The Wolfgang USA is the result of extensive road testing by Eddie Van Halen himself, as he played various prototypes of this guitar on tour to develop it to its maximum effect. The guitar includes such well-loved EVH guitar characteristics such as the 22-fret fingerboard, truss rod adjustment wheel, and maple neck. The Wolfgang USA features a Floyd Rose tremolo system, but guitarists can opt, instead, for the Wolfgang USA HT, which is a hardtail version that does not have a tremolo. The Wolfgang USA Custom is a beautifully designed guitar manufactured out of mahogany. It differs from other Wolfgang models in that the humbucking pickups are not direct-mounted and there are two volume control knobs instead of only one. The body of the USA Custom is thicker than that of other Wolfgang models, resulting in a heavier, full-bodied sound. True to EVH form, the USA Custom features 22 frets and a truss-adjustment wheel. The Wolfgang Special is priced less than the Wolfgang USA, but there is no compromise in quality. Its maple top is flat, instead of being carved like its more expensive cousin. Otherwise, the superb playability and craftsmanship remain the same, with features like a basswood body, direct-mounted humbucking pickup, and stainless steel 22-fret fingerboard. The Fender Frankenstein is one of the most highly anticipated guitars to ever be produced. While the Kramer 1984 Reissue was a budget version of the Frankenstein, the Fender Frankenstein is designed to be an exact replica, down to every last detail. Check out the Frankenstein's official website for details and information. Musician's Friend - Musician's Friend is one of the largest online music stores. They feature a good selection of items with competitive prices, and they offer free shipping for orders over $100. zZounds - zZounds offers both competitive prices and free shipping. They have an excellent website that shows whether or not items are in stock. Financing is available on high ticket items like EVH guitars. Sweetwater - Sweetwater has good prices, and they also feature product reviews that are prominently displayed. Financing is available, and customers receive free technical support on purchases. Like Eddie Van Halen himself, the guitars created and innovated by this legendary rocker have had a major impact on the design of electric guitars. Eddie sought to create his own unique sound, and by pushing the envelope and revolutionizing all aspects of the design, he has helped create instruments that set high standards for all other rock and roll guitars to follow.